Denmark voted in a general election on Thursday which was expected to bring the centre-left back to power after a decade in opposition and deliver the country's first woman prime minister. Polls have predicted that Helle Thorning-Schmidt, 44, who heads the Social Democrats and a broad centre-left coalition, is likely to turf current Prime Minister Lars Loekke Rasmussen, 47, out of office. 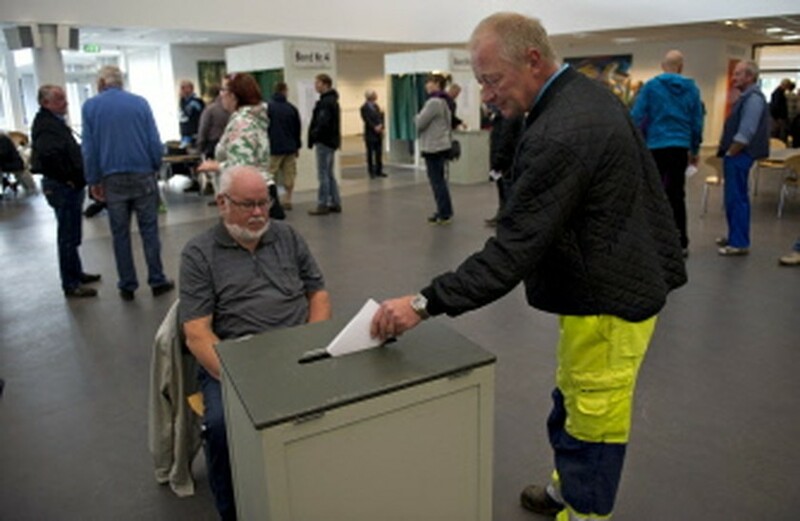 A Danish voter casts his ballot on September 15, 2011 in Fredericia, west of Copenhagen, in a general election, which is expected to bring the center-left back to power after a decade in opposition and deliver the country's first woman prime minister. If the coalition government, made up of Rasmussen's Liberal Party and the Conservative Party, loses, it will also end the powerful influence wielded by its key parliamentary ally the populist, anti-immigration Danish People's Party (DPP). A slew of polls handed the left-leaning opposition, made up of the Social Democrats, Social Liberals, Socialist People's Party and Red Greens a clear lead over the government and its parliamentary supporters, the DPP, the Christian Democrats and the Liberal Alliance. While showing a narrowing gap between the blocs compared to polls in recent days, none showed the current government leading the pack, and that has been the case since Rasmussen called elections late last month. They indicated that the centre-left would win between 90 and 92 seats in Denmark's 179-seat parliament, against between 83 and 85 seats for the centre-right. Denmark's autonomous territories Greenland and the Faroe Islands hold two seats each. In the last elections in 2007, the centre-right government and its allies took 94 seats against 81 for the centre-left opposition. A Voxmeter poll for the Ritzau news agency meanwhile showed that Thorning-Schmidt is by far the preferred candidate to head the next government, with 48 percent overall backing her, and a full 59.7 percent of women questioned saying she would make the best prime minister. Thorning-Schmidt is the daughter in law of Neil Kinnock, the former leader of Britain's opposition Labour party and one-time European commissioner. Rasmussen meanwhile received 45.2-percent overall backing in that poll of 1,751 eligible voters. Shortly after polling stations opened at 9:00 am (0700 GMT), voters were already streaming into polling stations under a clear blue sky. After a brief, three-week campaign focused almost exclusively on how to reboot Denmark's crisis-hit economy, some four million of Denmark's 5.6 million inhabitants were eligible to cast their ballots before polling stations close at 8:00 pm (1800 GMT). Voter turnout is traditionally high in Denmark. In 2007, more than 86.5 percent of eligible voters cast their ballots.